Merriam-Webster Dictionary. Acute. www.merriam-webster.com/dictionary/acute. Accessed October 21, 2018. 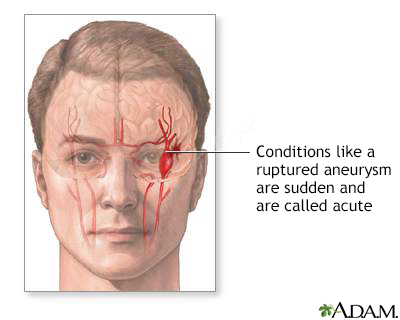 Acute conditions are severe and sudden in onset. This could describe anything from a broken bone to an asthma attack. A chronic condition, by contrast is a long-developing syndrome, such as osteoporosis or asthma. Note that osteoporosis, a chronic condition, may cause a broken bone, an acute condition. An acute asthma attack occurs in the midst of the chronic disease of asthma. 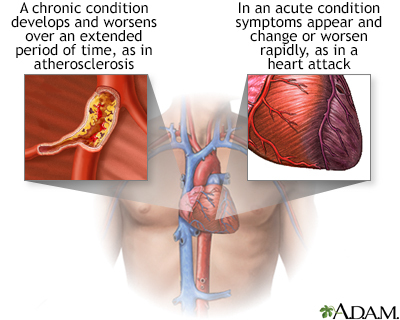 Acute conditions, such as a first asthma attack, may lead to a chronic syndrome if untreated.